Artists impression of Rich Street Precinct. Photo: supplied. Posted May 9, 2018 by Jade Morellini & filed under City Hub. 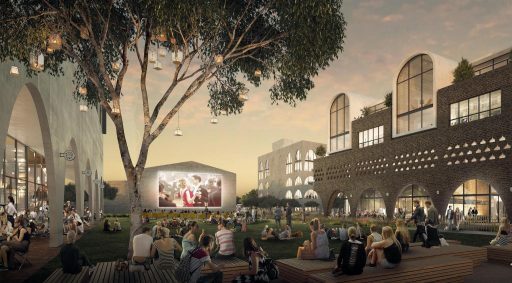 Developer Danias Holding has threatened to pull out of Marrickville’s proposed creative hub, saying that the Inner West Council is taking too long to approve it. The proposal involves converting an old timber storage yard to a 500-artist hub, including office space, cafe and a park. Danias Holdings told Domain.com that the “Council could approve the hub now without the Development Control Plan or the Voluntary Planning Agreement if they wanted to”. But the Council says its “master plan process aims … to understand and retain the areas distinct sense of place and industrial ‘gritty’ character that is unique to this sweet in Sydney’s inner west’, and that it “… is also conscious of streetscape improvements leading to gentrification and blandness of place”. Danias Holdings proposed the creative hub to the Marrickville Council, which has since merged to become the Inner West Council. On Tuesday the 1st of May the Council announced a 28 day public exhibition for a development plan in Marrickville and Sydenham. This includes the proposed creative hub. The site is currently a cluster of warehouses, used by 10-15 people for storage and as a workspace. The creative hub would be a workspace for creative professionals, such as videographers, painters and musicians. Developments on Victoria Road, which connects to Rich Street, will impact the Rich Street Precinct. Industrial land is being rezoned for apartment and business building developments. 80 per cent of the Victoria Road precinct is being reserved for business: about one thousand new apartments are estimated to be built by 2036. Most of this land is currently owned by Danias Holdings. Council will introduce a 28-day public public exhibition period, allowing businesses and residents to view the proposed developments in Marrickville. There will also be a 14-day period where the Council will accept submissions. Other developments in Marrickville include real estate group Mirvac building apartment block Marrick & Co, which includes a playground, cafe and library.